Kinemalogue: Walt Disney, part VII: Won't you be our neighbor? A reasonably pleasant diversion for a film made at the behest of the U.S. State Department, Saludos Amigos has some pretty low lows, but its usual tack is genial, colorful, and funny, and if you showed it in a classroom today it's at least possible you might not get mobbed on Twitter, which for a Disney film made in 1942 about people other than Europeans is, frankly, a sterling achievement. I know you know this, but it's worth pointing out: the so-called Golden and Silver Ages of Walt Disney Studio were not coterminous. 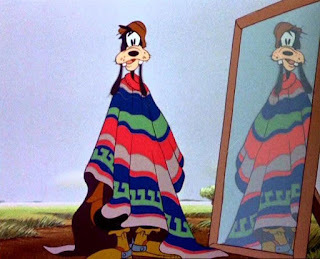 There was a long and sometimes-forgotten period following the 1942 release of the last Golden Age film, Bambi, that encompassed roughly eight years and, according to Disney's canonical arrangement, fully six animated feature films (plus a couple more if you count the things they don't). Perhaps the least-appreciated time in Disney history, this stretch is typically described as the Package Film Era, after the mode of its production: features cobbled together out of shorts, sometimes strongly thematically-linked (as in our subject today), sometimes only questionably of a piece, and sometimes barely lashed together at all, by some oddball framing device or other. I think the term "package film" gained traction, also, because it's a somewhat deflating way to describe any motion picture, with the connotation of it being along the lines of "here's some Goddamn cartoons—enjoy." Indeed, the other thing the package films are known for is being an enormous step down in quality and ambition from the Golden Age. Sometimes they were still great; at least one package film was half of a masterpiece. But ain't none of 'em exactly Fantasia. In any event, the success of Dumbo had pointed the way to a cheaper, faster, and more profitable production style—the longer-gestating (and not-profitable) Bambi being a literal holdover—and the reasons for Walt's embrace of more limited horizons are legion. 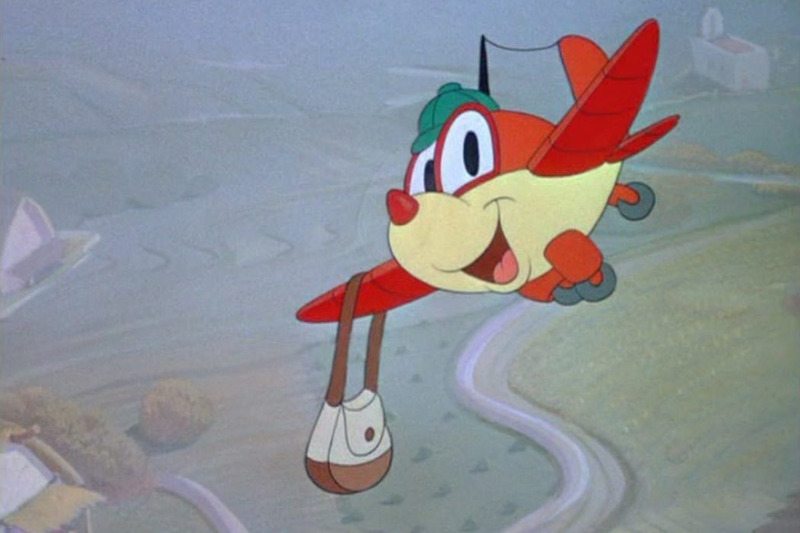 There was the animators' strike of 1941, which cost Disney some of its talent and meant higher salaries for the rest. There was the onset of World War II, which entailed the closure of many foreign markets, as well as the loss of even more employees. Above all, there was Walt's recklessness. The Disney Studio had started the 1940s with almost more money than its boss knew what to do with. He figured it out more quickly than anyone would've believed possible, and, by 1942, "package films" were about all Disney could afford to make. Yet the delineation between the two periods is not a big bright line, as any look at the production history of the first package film, Saludos Amigos, will tell you. (Or any look at the credits: "Wolfgang Reitherman? Isn't he out flying a P-40 somewhere?") Its genesis rested not so much in commercial considerations as patriotic ones, though some personal ones bore on it too: in the midst of the '41 strike, Walt, having decided that potentially having his nose broken by Art Babbitt was a bad idea after all, organized a little trip, with the blessing (that is to say, the financing) of the U.S. State Department, leaving brother Roy to deal with the strikers (which he did, more reasonably). 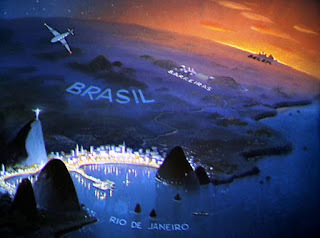 On a mission headed by Nelson Rockefeller (then coordinator of inter-American affairs at State), Walt and a team of loyalist animators, composers, painters, etc., went on a tour of South America, under the auspices of Franklin Roosevelt's Good Neighbor Policy. The aim was to eventually make a film that could be shown in the U.S. and in Latin America, and bring all our nations closer together—a vital consideration as the U.S. approached war with Nazi Germany. Ultimately, four countries were visited (Peru, Chile, Argentina, and Brazil, respectively), and many Latin American artists, musicians, and regular folk were consulted, some obviously more than others, whilst the Disney crew generally soaked up the subequatorial vibe. 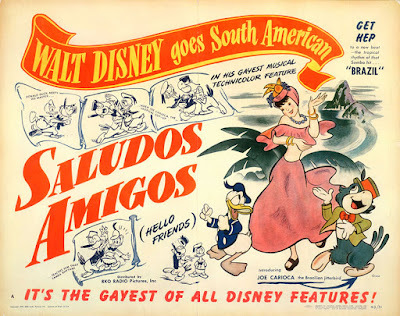 The result was a cartoon for each country, combined into the shortest of Disney's canonical works, a slim 42 minute "feature" made mostly to reassure South Americans that North Americans liked them, and to showcase to North Americans that South American culture strongly paralleled our own. Actually, thanks to this splitting of differences, it's kind of unclear exactly who the audience for it is supposed to be: in theory made "for" Latin Americans, it takes the form of a travelogue—live action bumpers document the Disney expedition itself—which means that, in practice, each individual segment is telling its presumed audience about a country they already live in, usually in childish terms, while finding fascination in things that it's not always obvious they would, sometimes to the extent of describing to them how their mail system works like it's surprised they have one. (It's narrated throughout by Fred Shields, both in the documentary segments and over most of the cartoon shorts; I strongly assume it was narrated by someone else for Latin America, but I sure can't find by whom. In the Spanish and Portuguese versions, there could be some crucial differences in tone.) Anyway, I guess I can't argue with the outcome. Amigos was a hit in South America, premiering in Rio de Janeiro in the August of 1942 just one week after Bambi in New York, and did well in the U.S. the following year. So: after explaining the basic backstory by way of some fun cartoon maps, Shields welcomes us to our first segment, Peru's "Lake Titicaca," where we find Donald Duck (Clarence Nash) has begun his own South American vacation. It's what you'd expect: Donald makes his irascible way through a series of gags, typically altitude-based, as he climbs through the Andes and learns about Peruvian indigenes and the famous mountains and lake they call home. Of course, he faces the placid contempt of a llama as well (an attitude called out in Shields' narration and depicted in the documentary footage, if not really borne out in the animation of the antagonistic llama itself, who's mainly just annoyed). And, of course, Donald suffers, he gets mad, and he falls from things relatively often. It's pretty okay, even though it's by far the most othering of any of Amigos' shorts, exoticizing the Quechua people without fail. Then again, at least it has Peruvians at all. The next segment takes us south to Chile and to "Pedro," which is the nadir of the film by any metric: aesthetic, comedic, representational, whatever. 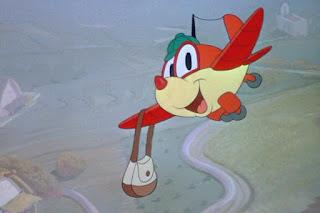 It's about mail planes, though it actually took me two viewings to grasp that this was the foundational pun of the segment, since it was too dumb to register the first time: it's about a baby mail plane, Pedro, son of a big male plane (get it? ), and a medium-sized female plane. I'll admit, recognizing the joke makes me like "Pedro" very slightly more, but this is all basically unacceptable anyway, partly because of its gender stereotypes, but mostly because it really wants us to think about things we usually wouldn't with anthropomorphized machines, from how they could possibly grow to "adulthood" to how they bear young to how they even copulated in the first place. (Dr. Strangelove style?) It's all wrapped up in a deeply unpleasant anthropomorphic package, no more successful than it would be decades later in Cars and its Planes spin-offs. The connection there is one extremely straight line, with the planes' cockpit windows turned into unnervingly gigantic eyes, and it's gross. Naturally, their animation involves a lot more squash-and-stretch than one may consider desirable in a rigid aluminum aircraft, too. And the lips on the control tower? That's straight-up horrifying. Well, we find that our papa and mama plane are too ill to fly the strenuous route from Santiago to Mendoza, Argentina; that means it's up to Pedro. However, it's an open question whether he's up to the task of making it around the dreaded Aconcagua, a tall Andean peak with its own anthropomorphized, vengeful expression. Serving as Pedro's antagonist, the mountain is the only time I'm aware of that a Disney villain was played exclusively by a background painting. The final segment saves the best for last, though it's also perhaps the most unsatisfying. This is "Aquarela do Brasil," or "Watercolor of Brazil"—and that title's to be taken literally. 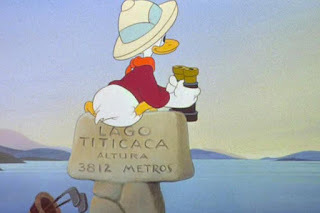 The "plot" is that we're catching up with Donald as he arrives on the last leg of his vacation, which has brought him to Rio de Janeiro (quite obviously the the Disney group's favorite destination on this trip). 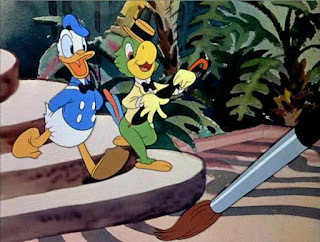 Here, Donald meets José Carioca (José Oliveira), a parrot based (according to Fields) on the protagonist of many Brazilian jokes, and he's cool, exhorting Donald to "samba!" He'd become a recurring Disney character, and remains instantly identifiable in his homeland. Altogether, Saludos Amigos may be an utter trifle, but hardly one you regret spending time with. (How much time could you spend with it, anyway?) Outside of "Pedro," which is an immense drag, it's entirely likeable even when it's faintly problematic, and it probably did teach somebody something. Meanwhile, it was enough of a success in its target market that it got a sequel in the form of The Three Caballeros. So it is good—even if the declining standards it represents weren't.